Leaving Fido at home when you’re out and about could result in a house that is trashed when you return. Using a pet monitoring device to see what your dog is up to at home is great because it allows you to relax in the knowing that your dog is ok. Dogs can be more mischievous while you are not around because they get bored, they miss you or they have separation anxiety. Dogs are better known for their mischief than cats on this regard, mostly because they’re used to being part of a pack and they feel isolated when you the pack leader leaves for the day. And we know you love your furry friend, and you will always feel guilty about leaving your dog home alone. Modern pet monitors do more than just let you watch your pet. They also enable you to interact with them thanks to features like pet cam treat dispensers, voice compatibility, night vision cam, motion censored video and picture capture as well as 24/7 live video streaming from your phone. Why Go for a Dog and Cat Cam? It keeps you connected to your furry friends, wherever you are. ​You can have live 24/7 video streaming from your mobile - see what state your house is in at anytime. ​You could set up motion sensing so that you’re alerted through images and videos when there is movement in the house. Some wireless devices have night vision that lets you track what's happening in the dark. There are cams that even dispense treats. Wireless HD Video monitors are great ways of knowing if your dog is doing well while you’re not with him. It also solves the mystery of chewed shoes, pillows, beds and other forbidden items, especially if you have multiple animals in the house. Moreover, this is a great way to give you a feel of you being around your dog or cat. Apart from that, these cameras can double up as baby monitors or just home monitors to ensure safety. In this section, we'll review three of the best ranked cameras. They are available at online retailers such as Amazon, eBay. as well as offline retailers. Most of these come at a discounted price and these three falls within the budget to mid range. We will also briefly look at what other options are available on the market. Compatible with a variety of dry, crunchy dog and cat treats. livestream video to monitor your pet with a 160º wide-angle view, day and night. Many busy, working professionals turn to pet cameras to take care of their pets and understandably so. It doesn’t make a lot of sense to employ a nanny to look after your pooch, and there are definitely times during the day when watching your dog from an app on your phone, tablet or PC makes everything better. But how do you go about purchasing a pet camera? What are the factors that one should consider? Live streaming quality: The primary objective of investing in a pet camera is so that you can spy on what your pet is up to when you are away. As such, the convenience and quality of live streaming are the most important thing you should consider when shopping for a pet monitor. Invest in something that comes with a smartphone app and a wide angle HD camera so that you can check up on your dog in real time. Two-way communication: While not that much of a priority, the ability to interact with your pet regardless of where you are is a bonus. Look for a pet camera that comes with a two-way communication feature. Night vision: This is particularly useful for those who are always traveling or working late. Treat dispenser: Don’t miss out on this if you want your pooch to be happy when you are away. Also, ensure that the dispenser works with the food and treats you give your pet. Motion or sound activation: It is no secret that some pet cameras are more advanced and offer more unique features that may be valuable as compared to others. Motion or sound activation is a good example of a unique feature that lets you know when your pet is barking excessively or has left a certain area. These days, our busy modern lives quite often take us away from home. If you’ve ever been in the situation in which you want to know what happens with your pets in your house while you’re away, there is now a solution: Petcube Bites. What is a Petcube Bites? Petcube Bites is an interactive HD pet camera that monitors your four-legged friend, it's stand out feature is that it dispenses treats. It’s been designed in a way in which owners can stay close and connected to their pets allowing them to see, talk, play, and reward their pet, while they’re away on business or holiday. Because pets experience separation anxiety when left to their own devices for long periods of time, destructive behaviors can manifest as a way to gain attention. The Petcube Bite offers an alternative to you constantly being present, either due to work commitments or social gatherings. The camera allows you to check on your pet within a matter of seconds, and then reinforce or disrupt any positive or negative behaviors. This can be especially important for owners who are trying to train their pet, when you can't be at home. Another important feature is that you can schedule treats to be dispensed at certain times which is ideal if you want to establish a routine. You can also attach a personal message, which will prompt your pet that the treat is coming, making for a better trained dog. Additionally, there is a music option with which you can recreate the environment that you both have while you’re home. If you have a cat, and you know they tend to be active at night, don’t fret! Petcube Bite has a night vision camera so that you can keep track of your cat’s movements. Any funny videos and photos can also be shared on social media within a matter of minutes. Your treat size needs to be the right size, too small and it flings out more than one per serving, and too big might cause it to fling none at all. 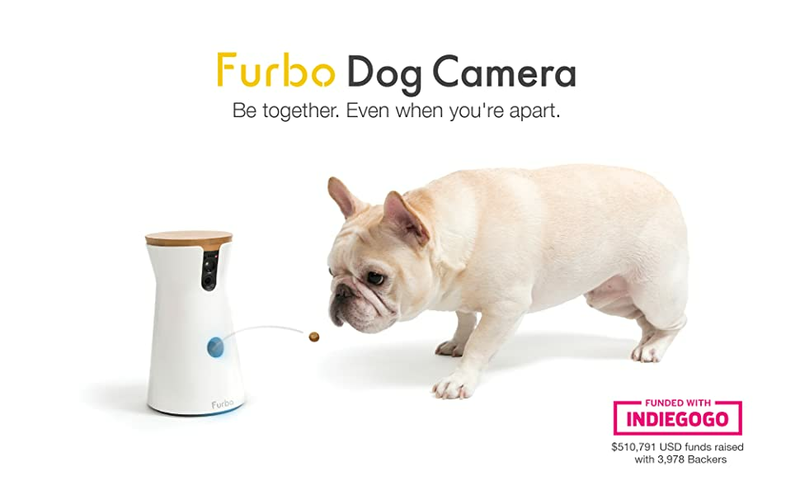 A new kid on the pet cam block is the Furbo Dog Camera. We love the great looking and sleek design and think it would fit in any home without being too obtrusive. Setting up was a breeze. We connected the Furbo to power, downloaded the App, and connected it to our wifi network.You can fire up the app at any time and have a look what your doggies are up to. You get a push notification when your dog barks and the Furbo is smart enough to recognize a bark from noise. We loved the clear crisp HD video and the 2-way microphone means you can call your pooch when you're lonely. You can dispense treats by flicking the treat function on the app. Watch the calories! The status light has your pet in mind, a white light shows that your Furbo has power. A green light means you're ready to get set up. A purple light means your Furbo isn't connected to Wi-Fi whilst a yellow means it is. We loved the yellow and blue lights as it has your doggy in mind. Dogs can see yellow and blue, which means they can tell when you're using Furbo. We also dig the night vision camera, see what your pals get up to when it's dark in the house. Petzilla is a new and upcoming company whose origin can be traced to IndieGoGo when it was funded. Being a new company, you’d think that no one would want to trust their product. However, Petzilla has proved that even a startup can design revolutionary products. They have made innovative technology available to the general public, and their customer service is exemplary. Simply read some of the reviews on Amazon, and you’ll find that someone from their team made a point of commenting to help out consumers. This pet monitor is more or less like a social network for you and your pet. Regardless of where you are, the Petzi Treat Cam ensures that both of you are always connected thanks to an app that it’s used in conjunction with. The camera allows you to take pictures and monitor your pet while the two-way voice function enables you to speak to your pooch. One of the coolest features of this pet monitor is that it comes with a treat dispensary that accepts anything that is 1” long. And in case you are wondering, the treat launcher can be activated easily from the app on your smartphone or tablet. Many customers who have reviewed this product on Amazon note that figuring it out is a challenge for some pets. Other than that, the Petzi Treat Cam is the best pet monitor you can invest in. This is another brand whose success story starts with a successful IndieGoGo funding campaign in 2013. Many homeowners who are in the market for the best security system often look to Canary and understandably so. The company offers cheaper, smarter alternatives to expensive, brand-name security systems. When it comes to all things home monitoring, the Canary All In One Home Security may just have all the others beat. It is the flagship product from Canary, and while it is mostly designed for security monitoring, this device also comes with some features that make it great for pet monitoring. It features humidity, temperatures, and air quality monitors that give a more comprehensive idea of what’s going on in your home. It also comes with automatic video alerts for both iOS and Android devices. It is the perfect monitoring device for anyone whose needs extend beyond keeping an eye on their pets. This is without a doubt one of the best pet monitors on Amazon, and the 4-star reviews from 2300+ happy customers is proof of that. Compared to most items on this list, the Dropcam Pro is more reliable and versatile. It comes with all the features that you need to ensure that your pet stays out of trouble and that your kids are safe. Such include an easy sixty-second setup, night vision, live video streaming, intelligent alerts, scheduling and two-way talk. The video quality is stunning, with an impeccable 720HD resolution, 8x zoom as well as a 130-degree field of view. The fourth best pet monitor is compatible with both Android and iOS devices. The Motorola Scout Wifi Pet Monitor is also compatible with tablets. The camera as well as its features can be accessed from the devices above and PCs as well. It is integrated with infrared night vision technology. It also comes with a two-way communication system that lets you talk to your pet. Its functions include zoom, tilt and pan functions. It can be used remotely even when you aren’t in the house and works in areas that don’t have plenty of lighting thanks to its night vision capability. It comes with an additional adapter as well as Scout1 camera technology, which is one of the best pet technologies available on the market. The device’s system can be connected with up to four cameras, and the one that comes with it has a rotational scope that gives you a full view of what your pet is up to. The flexibility of this feeding and monitoring device goes a long way in explaining its high price tag. It is a solid option to take care of pets when away. It comes with six different compartments for your choice of medication, treats, and food. The compartments ensure that the food is sealed within the unit, allowing even the wet foods to stay good for up to 48 hours. You can use a six-second pre-recorded message to call your dog when it’s time to feed. The webcam works on Android, iOS and Windows devices. The device also notifies you via text when your dog has eaten or will soon eat. It can set one-time or scheduled feeding times. The main disadvantages of this pet monitor include only a floor level view and absence of two-way audio. The fact that the camera isn’t HD may not sit well with others. This pet monitor comes with two add-ons that aren’t present in any of the other monitors on this list. The first is an option PawCall button, which when activated sends a signal to the device alerting you that your doggy or kitty wants to video chat. I don’t think there is a better way to interact with your dog when you are away. Of course, this requires a bit of training. The second is the ability to release a calming scent. This helps to calm and relax your pet, which is particularly important if you aren’t around. While the price is much higher, the ability to diffuse anxiety in your pet might be key for your pet. Other notable benefits of this device include two-way audio and video, treat dispenser and responsive customer service. This cam comes with live streaming as well as night vision capabilities. It requires access to electricity and internet access to operate. It comes with 1280 x 720p HD resolution for easy to see screen and clear streaming. The night vision is superior compared to most on the market and the motion sensor is just as good. You can set up several cameras and stream from different devices including your iOS or Android smartphone and PC. If you are using the camera on a Wi-fi network, you can zoom in, alternate between day and night vision, record film, send photos, as well as mute or un-mute the two-way audio. The main downside is that the video recording only works with an internal SD memory card and doesn’t have remote recording capability. Next up on the list of best pet monitors is the Piper mv Smart Home Security System, which is an upgraded model from Piper Classic and whose night vision is impeccable. It comes with everything that a pet owner could ask for and more. Features include real-time HD video and recording, temperature and sound monitors, night vision and two-way audio just to name a few. And as if that isn’t enough, this device also comes with home automation capability that allows one to control the doors, windows, lights as well as other appliances. It is one of the best interactive pet monitors, especially for those who aren’t interested in food dispensers. With competition rife in the pet camera industry, the Pawbo Pet Cam offers everything a pet owner needs to beat most products in the market. It comes with a whole lot of fun and interactive features including voice compatibility, laser games, and treat dispenser. It is a small monitor, perfect for those who don’t want something bulky in their space. The camera is made from plastic and has a black & white appearance. It comes with three controls including the power cord, WPS and reset buttons. A speaker at the back allows for two-way conversations with your pet. It comes with a 720p front-facing camera, 110-degree wide angle lens, as well as a treat dispenser that can be controlled via a phone app. It, however, doesn’t have night vision, although this shouldn’t be much of a deal breaker. If you are looking for an ideal device with all major features, the Logitech Circle camera will make the best choice. You can check in , see everything in crisp and clear HD quality, save and even share all those moments from your mobile device. This is a smart home safety device which helps you stay connected to your base even if you are physically away. The camera provides private and free 24 hours secure cloud storage option and the AES system encryption. It’s amazing features offer you peace of mind day and night.It is quite easy to set up using the accompanied app and connecting to this system can be done within 60 seconds. It offers high security using the free Logi Circle iOS app as well as other Android mobile applications. You could customize the settings which can be used for multiple cameras. ​The device allows you to make 24 hours free cloud storage of your videos. Check with your provider if you need additional cloud storage. You could also get unlimited full HD streaming videos at all times using the 135 degree wide-angle glass lens. The camera provides clear night vision that gives you videos of whatever is happening in the dark up to a distance of 15 feet. The system is portable and rechargeable. It has 12 hours of battery life and is transportable to be placed wherever you want the animals to be tracked. This machine holds a in-built speaker and microphone that leaves you connected through voice to not only see what they're up to, but hear too. You could even access the customised time lapse option of streaming an on demand video that summarises your pooch's day in 30 seconds. This is great to show folk what your animals get up to during the day.Circle can identify major movements and all those interesting actions can be scanned and replayed using Smart Filtering. Also you get smart alerts on genuine activities such as opening a door rather than a rotating fan. Capture each moment, save and directly share it from your mobile device. The Activity Light will indicate if someone is checking in or the circle needs to be charged. It provides 8x zoom for live or recorded videos and can be mounted to walls or used freestanding on a table. In order to get the most of this efficient system, you need a high speed internet Wi-Fi connection, an iOS device like iPhone with iOS 8.0 or newer; iPad 3, iPad mini or iPod touch or newer versions of these operating systems or an Android device with Android 4.4 or newer. This camera comes with 2 years limited warranty. The package holds 1080p HD camera, rechargeable battery, charging ring with USB cable, power adapter, magnetic wall mount and quick start guide. Why go for the Logi Circle? This one might be of limited functionality due to its software and app functions. It makes an ideal puppy monitor if you are not looking for complete CCTV material. It’s not the greatest security monitor, but it’s ideal for monitoring your dog. There are few flaws to this system that may not be major deal breakers.The speaker itself is fairly weak. Our normal speaking voice, through our iPad, came out of the Circle a bit softer than ideal. It sounded better than a mumble, but you really need to be close to the device to hear anything coming out of the speaker. Unfortunately, there's no way to adjust speaker volume on the Circle, or microphone sensitivity through the app. It wasn’t a problem for us because your dog will be close by when you speak to him.At the moment it isn’t compatible with Windows laptops or phones. The footage cannot be downloaded, retrieved or erased. If you are on vacation, make sure to plug the camera in and Wi-Fi switched on. Logitech Circle Wi-Fi Portable Video Monitoring Camera is an apt system to be in touch with your furry pals if you are busy enough not to make time to be with them. This keeps you connected to them day and night. Are you looking for a simple, customizable, efficient wireless kit? Then you should take a look at Samsung Smart Cam which offers full HD 1080p, two-way audio system with active motion detector and motion zone selector. It is a system that is compatible to stream videos to your computer, laptop or your mobile device. This makes keeping an eye on your dog quite simple and you miss out on virtually nothing. To deliver high-caliber performance, the system comes with many advanced features. It is easy to set up within minutes using iPhone, iPad or any Android device without installing any software. ​It is quite user-friendly. You simply need to download the SmartCam app to your mobile, place your device in the desired location, plug it in and follow the steps to install the system. The system gives 1080 full HD quality video with CMOS sensor giving vivid details and vibrant colours using existing light. The system gives 1080p clarity on laptops or computers and 720p on mobiles. The high quality motion detection feature is provided using SmartCam HD Outdoor technology. This feature can be customised to choose the level of activity you would like to track to trigger alerts. The Motion Zone Selector lets you identify three areas within the field of view where you would like to set the motion alerts on. The Local Video Storage facility provides the option to store 720p HD video on a 32GB microSD card which is an additional purchase. You can use any microSD card though, so it’s an affordable upgrade. It offers three setting options to continuously record, record at specific timings or record only when motion is detected. These videos can be finally viewed on your computer or mobile. Even if you are physically away or behind closed doors, the SmartCam will send you instant alerts via email or push notifications on detection of motion, simultaneously recording it onto the micro SD. With Samsung's IO66 Weather Resistant feature, you can keep away worries related to heat, cold, wind, dust of rain. The SmartCam has a larger field of view with 128 degree ultra-wide angle lens, giving maximum coverage without compromising on video quality. The night vision is also great allowing 50 feet coverage in darker settings. Colour distortions is minimal with the advanced IR cut-filter which filters certain light during day time and cutting-off filter at night giving crisp black and white video. This makes for a high-end tracker for your puppy since Samsung provides multiple-level encryption protection from camera-account level to bank-level encryption for additional security. The two-way speaker system keeps you communicated with your k9 and sound quality is enhanced using speakers. The advanced detection option automatically detects anything that is actually concerning. The package comes with a Wi-Fi device, cable, base for Wi-Fi; power adapted and start-off guide. Why go for the Samsung Smart Cam HD? Though the equipment comes with some great features, it has some minor flaws. One such flaw is a high motion sensitivity that sets the alarm off on a whim or it dropped our Wi-Fi connection. Samsung suggests that you hardwire the system to your router if at all possible. We also imagine they’ll be releasing a firmware update to address these issues soon. The Samsung SmartCam HD is a great option if you want a monitor that can keep track of your pooch's activities and keep in touch with your pooch from remote locations. This advanced equipment will keep track of each and every movement and notify or alert you on any suspected activity. This is one of the sleekest pet monitors on this list. Its history can be traced to a funding campaign on Kickstarter and shortly afterward, it became an Amazon Launchpad product. In addition to its high-end look, this pet monitor is designed with interactivity in mind. It has recently been updated to a 1080p HD camera with a wide field of view so that you can take pictures and capture videos using your Android or iOS device. The two-way audio device allows you to talk to your cat or dog while the laser toy does a good job of engaging your pet while you are away. Some reviews cite that the laser toy is not 100% accurate to inputs and the camera at times presents delays. Other than that, the Petcube is a great investment for anyone whose main concern design. This is a neat little compact monitoring system is shaped like a cube. It has integrated camera, microphone, speakers and laser pointer. You could connect it to your Wi-Fi network and the system allows you to see, hear and talk to your pals. If you are too held up, hook up your friends or family to take care and play with your puppy instead. This one gives a 138 degree wide-angled view and streams a 1080p video to your mobile device or to your desktop. The laser pointer can be remotely controlled to give your cat some stimulation and much-needed exercise without running around with him. This 5mW3R class laser is being certified and is safe to be used on your k9. The latest version of the app makes it easy to have calibrated movements. You could allow strangers to play with your dog using the app, thus allowing some social networking. The equipment has a sleek design with aluminium housing and the whole structure weighs 1.3 pounds. This device is compatible with iOS and android and can be simply hooked up using your Wi-Fi connection.The app allows you to share moments captured using your smart phone. The design of the cube contains a non-slip bottom and a standard tripod on which the camera can be mounted. Why go for the PetCube Interactive Camera? This device is a basic option for tracking movements when you are near or far. But the system lacks few features that you might find in its counterparts like treat tossing. For a treat tossing version, see the updated Petcube Bites review below. If you are looking for a basic monitor with limited functionality, PetCube Interactive Wi-Fi Pet Camera will be a good system to invest in. This lets you see, hear and talk to them with decent resolution images and other features and can easily be labeled as the Best Monitor of 2016. The pet camera is a relatively new technology that is becoming more popular among pet owners due to the convenience and peace of mind it offers. Whether you are missing your pup, guilty, worried or busy, this gadget offers an effective solution to your woes. And due to the massive number of options in the market, choosing the right pet camera may prove a challenging task for some. This guide aims at easing that challenge and ensuring that whatever your needs are, you find what works for you without much hassle.